snarf… bargle… urk… mmf… hello. I’m back home in Atlanta and trying to jump-start my brain. It seems it objects to being hauled back and forth through four time zones. Should today’s exercise lack lucidity, for heaven’s sake, tell me. For most of us, colours are the strongest of all imagery. Think about it. Green. Right? You either saw a shade of green, saw something green, like grass, or started to list the greens you remember from your Crayola Crayons (remember sea green?). While other imagery might give you a clear picture, it won’t be as vivid, or as immediate as red. You can introduce colours in a couple of ways. You might choose objects that are inseparable from their colour, such as lemons. You might keep you poem neutral as far as colour and then deliberately and precisely place pink. Or, you might make colour the focus. The trick is to not overdo colours as imagery in a poem, even when they are the focus. Make two lists: one of colours that attract you, and one of colours that repel you. 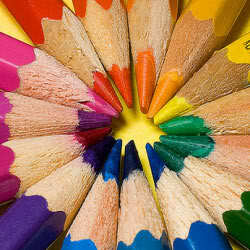 For each colour, write what you associate with that colour. Approach each colour from your other senses; how do these colours sound, smell, taste, and what is their texture? Jot notes for a few minutes. Which images that emerge from your jottings give you an idea for a poem? Go! Take off in your own direction, but colour must be involved somehow. list everything you associate with one colour, say red. Write a poem that focuses on the colour you picked. Point of interest: Flowers are the colours they cannot absorb, the one shade of the spectrum they reject. No, don’t ask why part of the post is a different size. My laptop is misbehaving, too. I am contemplating the satisfying sound of a computer, or two, dropped from a seventh floor balcony. I may, or may not be back into the routine, so you may, or may not, see me Thursday, or Friday. If so, yay. If not, I will see you next Tuesday for… what does the calendar say? Mystery. Ah, well then. Can you feel the flaking paint? The cool smooth steel? The crumbly, light as air, burnt match head? Hello, all. I hope you are well. My husband visited for a week at my mother’s and did something miraculous with the computer connections — after many days of hair pulling. I hope to read some of your poems in the next couple of days, if my brain hasn’t gone the way of the computer connection. If not, write, anyway! How often do you think about textures when you describe things? How thoroughly and deeply do you touch things? The impulse to touch or to want to touch something unusual, unknown, or intriguing is natural. The desire to touch has been part of our psyche as long as learning has, because touch informs us and imparts knowledge in a way that perhaps only sight does, as a sense. The impulse to touch is stronger in some. I cannot see something new, or something which attracts me, without wanting to touch it and if I cannot, I feel incomplete. Museums and art galleries are torture. Are you a tactile person? When you shop for things, especially clothes, do you ever finger the fabric or material from which the thing is made? In museums do you itch to stroke the sculptures? To explore them with your fingers? If our socialization didn’t discourage us from learning through our tactile sense, we would be forever touching things to learn about them. What do you learn from touch, from texture? Think of handshakes, hugs, the touching of rare or holy objects, holding a baby, kissing someone’s cheek, or mouth. List, next to each texture, what you associate with that texture. Mentally feel your way around a person, an object, an event; meditate, in words, on what you understand about objects or people, through texture and touch. I am including several photographs by Paul from freedigitalphotos. His pictures are particularly sensory. Look at each photograph and in your mind feel the object and describe what it feels like to touch the different parts. Do not forget that part of touch is not just texture, but also temperature. The asparagus to your left, still raw, the stem cool and smooth, the head nubby. 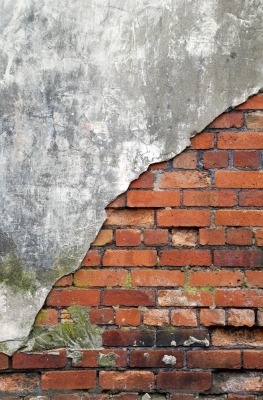 The wall below, with the plaster and the brick, each rough, but the brick more crumbly, the plaster smoother. The spiky conker with its satin smooth seed. Each provides multiple textures, often contrasting. Look around wherever you are and let your fingertips sense textures, feel them in your mind. I shall see you next Tuesday for a prompt to do with storms. Poem Tryouts: What Does This Smell Like? Hello, all. Two posts today. I shall give you the prompt now, then, later, send out the calendar for the summer. I want to keep the two elements separate. We start our summer program with an exercise to do with imagery, one of the most important aspects of poetry because that is one of the main links between the poem and the reader. Whether the poem focuses on story, theme, or description [or any combination of the three], imagery, sensory imagery, is the bridge to the reader. Something many writers forget is that imagery includes all the senses, not just the visual. While visual imagery is strong because most people are image oriented, the sense of smell is powerful because it is the one sense routed through the memory area of the brain. Tactile imagery attracts all those people who have to keep their hands in their pockets in a museum [I’m one – I learn and make my bridges through touch]. And we are bombarded by sound everywhere. If you employ imagery, your reader can step into the poem. Check Keats’ poem “The Eve of St. Agnes,” if you want to read a master of sensory imagery: Forty-two stanzas and worth every minute you spend reading. We will try several exercises which may, or may not, result in poems. Don’t worry if all you end up with is a list of images. They become a resource pool for you. 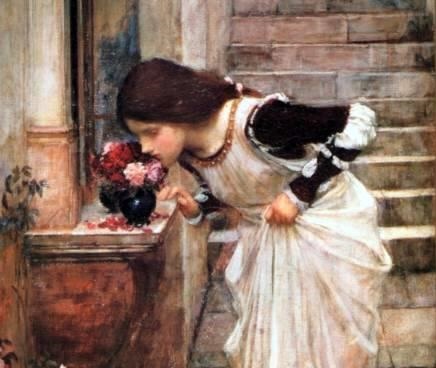 Smell is the most evocative of the senses. Of all our senses it is the one which will most immediately transport us to another place and time, because it routes through our memory. There are odours that spark passion and sensuousness and others that repel us physically. Our culture produces thousands of products to alter a person’s scent or that of her surroundings. Animals use scent to mark their territories. We use scent to mask and manipulate. Smell, scent, odour, fragrance, bouquet …what other words do you associate with smell? Go around your house, place of work, or choose a route to walk. Focus on smell only. Do your perceptions of a place change with smell? Below, we have several possibilities for using smell in a poem. Describe smells. On the left side of the page, list significant smells; and on the right side, jot down what you associate with these smells. Pick two or three and expand into a vignette. Describe two or three places using only your sense of smell. Don’t mention the places. Describe a person using only your sense of smell. Don’t mention the person. Describe your most vivid memory evoked by a smell. Enjoy focusing on smelling things this week. Smell even things you know the scent of, but now focus on the smell. What does this thing smell like? How do you put the smell into words that another person can smell? Dip into your spice jars. If there were no names for herbs and spices, how would you describe their smell? According to summer rules, you may write on this, this week, and post here, or you may choose the topic for three weeks from now, even though you will go into it without my bit of chat. Should you choose the latter, post here anyway, but tell people your poem is for the prompt three weeks down the road. You can slot smell in somewhere else, or ignore it and redo another prompt. It’s summer. I don’t really have rules but even they are at the beach. Hullo, everyone. I hope you are well. Welcome new readers. It has been a while since I have done that and I know I have several new names. Please, if you have any questions about the way the blog works, pop into comments on any day. If you have not read the poems from last week’s contributors, visit for a while. There is always a lot of conversation so look for the red links. I was wandering through Steve Kowit’s book In the Palm of Your Hand and came across this exercise, which I thought you would enjoy. I’ve adapted it a little, at least, put it into my words. Imagery is the representation in words of a sensory experience. A poet uses imagery to make the reader see, hear, taste, touch, and /or smell what the speaker of the poem senses. Okay, that’s basic stuff, but sometimes we forget to include it with our stories, memories, narratives, even descriptions of a place. Our exercise today is one of detail. It’s a list poem. It does not require story. The objective is to provide a sensory experience. You are going to create an inventory of everything in a particular place. I used to send my students out and tell them to find one place on campus and sit for twelve minutes, before writing a list of everything in their area they could describe in a sensory manner. Twelve minutes is a surprisingly long time, time enough for the surface stuff to disappear and to become aware of what is beneath. Place is up to you: a park, the beach (some people are in the other hemisphere! ], your yard, a room where you work, a file cabinet, or a desk drawer. Kowits says: Perhaps if you are ingenious or ambitious (and I know you are both), you can take something as small as a flowerbox and describe dozens of minute objects and creatures–from small pebbles and ants crawling on the leaves, to the colors of a single weed and the curled form of a desiccated leaf. As with any list poem, you can’t start the poem before you have a list. When you have your place (and I’m thinking the smaller the more fun, because of the challenge), list every single thing in it. Then go away and do something for a few minutes. It doesn’t require long, but it does require a completely new view for your eyes. You will be amazed when you return, the amount of things you missed. I should know. I’m a Hidden Object game devotee. (found in Wooldridge’s Poemcrazy). This applies to both reader and writer of poems. Go, find, absorb, list, turn into imagery that allows us to experience things for the first time. Format seems to go without saying; it’s a list. But, I have learned that you are a wild and crazy bunch, so if you think of a way to present your list in an un-list form, do so, but only if that form supports the content. I will see you Thursday for something on The Poetry Giveaway (yes, it’s that time again), and the poetry challenge I am involved in with The Found Poetry Review. If any of you have a National Poetry Month announcement they wish me to add, let me know: margoroby[@]gmail.com. I’ll see you Friday for the prompt roundup;and, next Tuesday is our image prompt. Hello, all. I hope everyone is well, as we head into the particularly crazy month. Whether you do Christmas, or not, it’s hard to not be affected by it in some way. My inclination this year is to head for the hills and find a nice cave [no, I have not started ordering… I guess I need to get on the stick]. Today is an image prompt. I am sending you to one of my Pinterest boards. One of the senses that is often overlooked in writing is the sense of touch. I know it’s an area I want to work on as I am a tactile person [hands in my pocket when we go into a museum is a must]. As I looked over the board yesterday, I realised that every image is mostly tactile — how I know is when my fingertips feel an object’s surface, as I look at it. The coloured pencils? I want to touch their pointy ends. The C-clamp? Cold, iron, slightly rusty. The challenge is to let one of these images spark a poem. Let your fingertips talk to you. As you look over these two images, run mental fingertips over their surfaces. Possible modus operandi is to, as you look over the board, select a few you like and jot notes on each. Does a specific memory surface? Does the image remind you of something? Does the tactile sensation itself remind you of something? You do not have to have the image anywhere in the poem. Once the poem takes off, you can forget the original image, or you can make the image a focus. The real challenge: incorporate texture into your poem in the way of imagery and, also, in the way of word choice. Words have texture. Joseph’s exercise, this week, is about the effect of a word’s sound. That sound is what gives a word texture. Not sure about that? Let me list a few words and as you read each, what texture do you assign it because of how it sounds? So, pick an image, or two, or as many as you wish, and see what happens. Let us know which image sparked the poem. It’s always fun to see. If you have your own tactile photograph which you want to use, go for it. I look forward to reading the results. I shall see you Friday for the roundup; and next Tuesday for a prompt about your road less traveled. Hello, all. We are going to approach place a little differently today. Resist the temptation to read the poem. Uh huh, I saw the eyes drifting down. We will read and talk our way through James Wright’s poem “Lying in a Hammock at William Duffy’s Farm in Pine Island, Minnesota”. First, will you look at that title! Look again. Poets, if they use a title, usually go one of two ways: they choose titles that are neutral, reflective of what the poem speaks of; or, they add vital information that the poet does not want to use poem space for. In this case, Wright establishes that the speaker is in a hammock [lying down], on a farm, on an island, in Minnesota. So much information about place, without having to use poem space. Now you may read the poem! Just read it without, if you can, letting your poet brain start working. I’ll meet you below. Yes? Reread the poem and look for every single sensory image. Then, come back here. Visual is almost entirely colour: ‘bronze,’ ‘black,’ ‘green,’ ‘golden’ and implied in ‘shadow,’ ‘sunlight,’ ‘blaze’ and ‘darkens’. Sound: ‘cowbells’. You can argue that ’empty house’ implies silence. Smell implied: last year’s ‘droppings,’ cows, horses. Now list verbs and verbals: ‘see,’ ‘blowing,’ ‘follow,’ ‘blaze,’ ‘lean,’ ‘darkens,’ ‘comes,’ ‘floats,’ ‘looking,’ ‘wasted’. While we are here, note the phonetics of Wright’s choices. After Joseph’s phonetics exercise, I am more aware than I already was of sound and its effects and found the use, or lack of use, of certain sounds supports the content in this poem [as it should]. Almost every sound is open, as is the speaker to his epiphany. While we are at it, notice the strength of Wright’s nouns: ‘butterfly,’ ‘trunk,’ ‘ravine,’ ‘house,’ cowbells,’ ‘field,’ ‘pines,’ ‘droppings,’ ‘ horses,’ ‘stones,’ ‘evening,’ and ‘chicken hawk’. What is the mood of the place, for you? How does Wright achieve that with the words he has chosen? Writer Maxine Kumin says, “In a poem one can use the sense of place as an anchor for larger concerns, as a link between narrow details and global realities. Location is where we start from”. The hammock, in this poem, is the anchor; the global reality is the speaker’s realisation that there is more to life than whatever he had been doing before coming to William Duffy’s farm. Wright has established this with a minimum of words that give us a wealth of detail. Let me pull myself back on track. Once you have absorbed the poem, jot down places where you have had an epiphany, remembering that, while epiphany is a word usually associated with positive outcomes, an epiphany can be about anything, and they can be tiny. While you are listing places, jot notes about whatever you remember about each place: what happened, sensory details, specifics, and mood. Choose one place you want to write about. Freewrite everything you can remember about the what and the where. Consider the anchor for your event and the larger concern. My challenge is that you structure your poem as Wright has. The poem breaks into four tercets, each tercet being a full sentence giving us a sensory image, except the last tercet, which has three sentences, growing increasingly shorter, leading to the epiphany. The four tercets are divided in half by a short directional phrase, “To my right” [and what is that about?]. Did I lose you among the tercets? Write a poem in any form that gives us a place and then establishes an epiphany that connects to that place. Feel free to make up details if your memory is fuzzy. Make them up anyway. If you are not following Wright’s form, consider others you know, to decide what best suits the poem’s content. As always, I look forward to reading what you write. You have forever to post [although readership may decline to me]. Take us through the process if you can. It’s a good habit and helps if you are going to revise the poem at any point. See you Thursday for announcements [you can send them to me up until Wednesday night my time]; Friday for our romp through prompts; and next Tuesday for a break in place [no, that’s not another type of place prompt, but a prompt that is not focused on place]. Notice how I segue into our topic for today: How do we go about instilling a sense of place in our poetry? Place is huge. Several of the prompt sites, that many of us frequent, have touched on place. I will try not to duplicate exercises, but this is an area we will play in for a while. Think about what you mean when you talk, or think, about place in poetry… feel free to jot notes to yourself as we go along. Notes warm the brain up. What is place? Does a place have an identity before we identify it, or give it a name? Once we identify the running water keeping us from the other side, as river, we begin to give it a more specific identity. Large river. Large muddy river. The Mississippi. The mighty Mississippi. Ah, now we are getting somewhere. The places that we identify, name, and give meaning to, have a strong sense of place. Our goal is to figure out how to establish that sense of place in our writing. We need to know what we each mean by sense of place. Is it merely physical? Does an emotion need to be attached to the place to establish the sense? Paris. An oasis. The Yangtze River. Stonehenge. The desert. What images and feelings popped up as you read through the list? Mull for a few minutes [you continue to jot notes] about how you might establish a sense of place if you were to write about one of these places. But let’s start with your own baseline landscape: The special bond which develops between children and their childhood environments has been called a ‘primal landscape’ by human geographers. This childhood landscape forms part of people’s identity and constitutes a key point of comparison for considering subsequent places later in life. As people move around as adults, they tend to consider new places in relation to this baseline landscape experienced during childhood. Wikipedia — article worth reading, should you have the time. It is short. Identify your baseline landscape. You may choose a larger whole, such as a city, or an aspect, such as surrounding mountains. Whichever you choose, it should possess that which cannot be replicated in any other place. Consider that your audience has never been there [even if you know they live in that place]. How are you going to convey the sense of place so that your readers have an idea of the truth of your place? More notes. The structure is up to you. Much depends on whether free verse, or a more formal form, is more suited to establishing your place. Remember that form and content go hand in hand. You will need to consider concrete details and sensory imagery in your quest to establish the sense of place of your baseline landscape. This week we have been playing with symbols with one of Joseph’s ‘Reveries‘. Consider symbol as a way in. You may decide that your piece works better as prose, and that’s fine too. Don’t keep yourself from posting because you think you must have a poem. The objective is establishing a sense of place in your writing. I can’t wait to read and feel your landscapes. Remember that you can and may post anytime. I shall see you Thursday for announcements — anymore to go in? Friday will be our roundup of the week’s prompts. And, next Tuesday, since you seem to enjoy them so much, a painting from which to write. P.S. Should a sense of dragon poem arise, post. We dragons have our own sense of place.